What would he have done? Would Nepal of 2061 BS have been any different had Dasdhunga not happened? Maybe. On the whole, the great man theory of history might not carry much analytical weight since socio-economic and political factors generally explain political trajectories better. However, some charismatic figures play pivotal roles in shaping the political environments of their times. As the towering figure of Nepali politics in the first few years of the post-2046 democratic era, Madan Bhandari played a pivotal role in shaping the contours of Nepali politics of the time. CPN (UML) had the Naxalite-inspired Jhapa Andolan as a part of its history. Engineering its transformation to a social democratic party was no mean feat. Bhandari deserves praise for steering the UML to the mainstream, without severing its commitment to a progressive agenda, and making it a formidable political force, despite the fact that those fanatically wedded to Communist dogma would term the transition Khruschevite. He subscribed to the notion that a genuine revolution need not be violent. Indeed, blood need not be spilled liberally as if it is chaulani pani; fundamental socio-political changes can be achieved without ditching basic manabiya sambedana if one can efficiently mobilise public opinion in pursuit of a noble cause. Bhandari had the requisite capabilities to do precisely that. He possessed the halo of a crusader, the finesse of a statesman, the oratorical prowess of Churchill, the pragmatic touch of a seasoned politician. 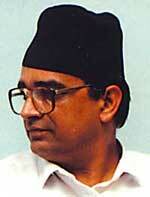 Most importantly, he displayed undying commitment to a more egalitarian and prosperous Nepal. He was the best thing to emerge out of the quasi-revolution of 2046. "It's not political, it's emotional," said Rahul Gandhi in a recent interview with Time. He was referring to the bond he (more aptly, the Gandhi dynasty) shared with the people of Amethi, his electoral constituency. The same could be said of Bhandari's bond with the Nepali janta. He connected with the average Nepali citizen; his words struck a chord in the people. Unlike most of today's political leaders, he was admired and adored by ordinary Nepalis. Sadly, that storehouse of talent and integrity passed away before he could lead Nepal's march towards a new dawn. It is a pity that the UML could not preserve his true legacy and degenerated, just like the other political parties, into a cesspool of sleaze, pettiness and corruption after his demise. The march to dawn never came. Instead, the country entered a vortex of violence and uncertainty. Would his continued presence in Nepali politics have staved off the country's descent into chaos? It is reasonable to assume that it might have. He had the qualities needed to fire up the imagination of the youth and serve as a rallying figure for the whole nation. Young people need a figure to rally around, a political icon to look up to. In the absence of a charismatic leader, the younger generation can go astray, especially when economic opportunities are limited. It is plausible to argue that Bhandari's leadership could have channeled the youth's restlessness and impatience towards the more constructive projects of development and relatively peaceful change. As an increasing number of fellow Nepalis become mere statistics in the country's battlefields and the country is locked into an excruciatingly painful war of attrition, we wistfully remember Madan Bhandari, lament his premature death and wait for a new leader of his calibre to emerge. We can't help wondering: what would the visionary leftist leader have done to untangle the nation's crises were he alive today?